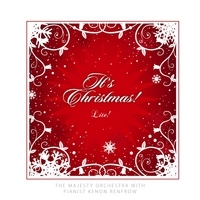 Lush orchestrations of familiar secular and sacred timeless Christmas Classics with piano. This album is the downloadable version, not containing any of the copyrighted songs found on "It's Christmas." This item is available as a digital download only. Kenon D. Renfrow joined the faculty of Bob Jones University in 2004 where he serves as Professor of Piano, Piano Pedagogy and Music Technology. Previously, Renfrow was Professor of Keyboard Performance and Director of Keyboard Pedagogy at The University of Miami in Coral Gables, Florida. He holds the Bachelor of Arts and Master of Music degrees in piano performance from Bob Jones University and the Doctor of Philosophy degree in music education from The University of Oklahoma. Renfrow has served in churches as pianist, organist, and guest artist for more than 35 years. He has worked with choirs, ensembles, and soloists as accompanist and vocal coach, and as musical director for major productions. While in Florida, he served as Minister of Music at First Baptist at Hillsboro, an independent Baptist church in Coconut Creek, Florida. Dr. Renfrow has published articles in American Music Teacher, Clavier, Church Musician, Electronic Musician's Digital Piano Buyers Guide, Keyboard Companion, Piano & Keyboard and the Proceedings and Reference of the National Conference on Piano Pedagogy. His music is published by Alfred Publishing Company and Soundforth. Happily married for more than 20 years, Ken and Beth have two wonderful college-age children, Laurel and Preston. In addition to his musical activities, Ken enjoys collecting handguns, shooting, motorcycling and restoring antique clocks.